During the 15th century when East Friesland was a county in the German Reich, the East Frisians were part of a gold rush. After a lengthy period of upheaval, peace came to the area and it entered its heyday under the reign of Count Ulrich, when art and craftwork flourished. Seafarers and traders brought jewellery and fine commodities to Friesland from their journeys, thereby spreading the filigree technique with which craftsmen in Byzantine and the Far East had long been familiar. The Frisians who had made their fortunes wanted to keep pace with the French nobility. They wanted to dress up in just as much splendour and, after all, plenty of gold was flowing to the area thanks to long-distance trading. Gold and silver had always played a significant role for the Frisians, according to tradition, Charlemagne permitted them to adorn themselves from head to toe with gold, as much as they could carry, without even having to pay taxes. Therefore it was not so surprising that even Countess Anna of East Friesland, who was otherwise known for her strict morality and modesty, asked the East Frisian noblewomen, in a police decree in 1545, to display their riches to the public. And the East Frisians obeyed this decree. 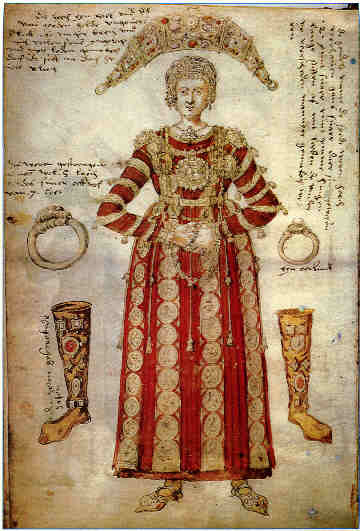 Women's costumes emerged which were decorated with small gold plates joined together by hinges and set with expensive gems. Even stockings and shoes were set with gold and a belt alone was said to have weighed two pounds. The costume also included a diadem, one of which was found in 1894. It was made of 20 carat red gold and was also set with gems and pearls. Unfortunately this valuable piece was lost during the Second World War. None of the costumes were preserved either. During the reformation, the Frisians' love of gold declined and the gold on the costumes was probably melted into coins and other items. nobleman, described the armour-like garments which were covered entirely in gold and even included colour plates in his work. According to him, there were about thirty families in East Friesland who owned these types of costumes. Even women from the middle classes are said to have adorned themselves with gold plates, decorated with gems and fine filigree. Gold was regarded in general as a stable capital investment, even for farmers, traders and craftsmen. The final triumphant progress of filigree around 1750 brought about the second great heyday for the goldsmith's craft in East Friesland. Expensive family jewels were made which were passed on from generation to generation. This traditional East Frisian filigree jewellery always contains repeated designs such as gold hearts, rosettes and shells as well as branches, boats and crosses. Goldsmiths even set up business in the smaller towns in East Friesland to produce the traditional East Frisian filigree. The Byl family goldsmiths is of particular significance in this respect as three generations of this family produced East Frisian filigree from 1806 and it was their craftsmanship which made the filigree jewellery famous outside of East Friesland.